The last 10 years have been a great example of how quickly the economy can change on us. One minute we’re making money, buying new houses and going on vacations. Then the next thing we know, the economy takes a tumble, our investments drop, our mortgages are higher than the market value of our house, and companies are laying people off, left and right. Many of us became quite stressed out as we watched our debt grow and our savings dwindle. And even now that we may feel like we have recovered, we know from this past experience, that having a large savings account, and very little debt, is honestly the best way to live. But how do we grow our savings when wages are flat and the cost of living continues to quickly increase. And by that I mean, that many people in North America, for example, are still being paid $10 to $15 an hour at their job, but the price to buy a small house is between $250,000 and $600,000, depending on where you want to live. How can someone earning $15 an hour ever afford a house? They start by being extremely careful with their spending and how they currently live. They find ways to live a frugal lifestyle. 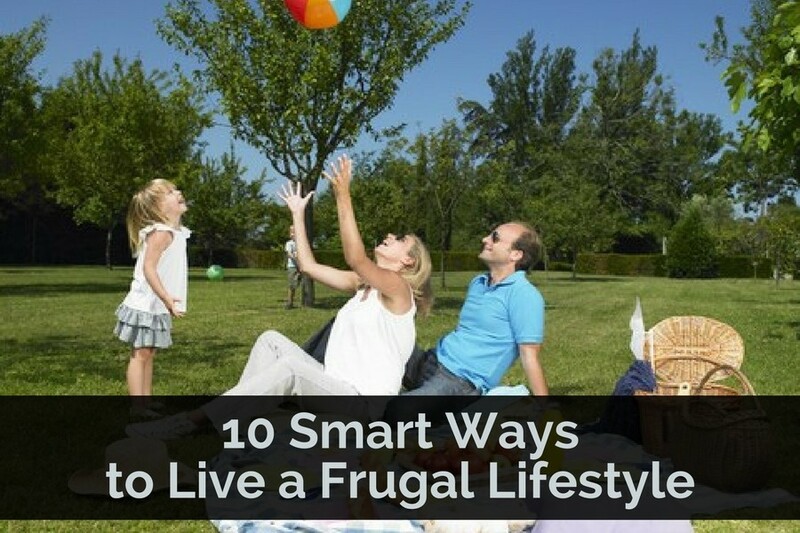 By living a frugal lifestyle you will be able to increase your savings. A lot of people make the mistake of assuming that living frugally means you deprive yourself. You live frugally so you can spend money on the things that are truly important to you. By cutting down on unnecessary expenses, you are able to save up and spend on the things that actually matter, like a home, your retirement, or your child’s college education, for example. First thing you have to do before you start living more frugally is identify how much you’re earning and how much you’re spending. This will give you a good idea of where you stand financially. If you’re spending more than you’re earning, then you see the problem right away. Start with your total monthly income, then subtract your necessary fixed expenses like rent, food, insurance, utilities, etc. Now also add in the amount that you will put into your savings account each month. It may be $50, or it may even by $500 or more, depending on your situation. Once you subtract all of that from your monthly income you will see how much money you have left to spend on other expenses. When you have a goal — something you’re saving up for — it’s easier to stay frugal. Set your sights on something big, like a nice two week vacation, or renovating your kitchen. You could even save up for a new house. Make sure you know what your priorities are, so when you’re tempted to buy new clothes, you can think of it as taking away money from your goal — which would then stop you from making an unnecessary purchase. Instead of borrowing money, borrow the things you only need for a short time. For example, the library is a very important ally when you’re trying to live frugally. Instead of buying books or movies, go to the library and borrow something. This should provide you with hours (or days, if you really love to read) of entertainment. It’s a good way to enjoy yourself without spending money. The same goes for some household items. Did you know that the big box home improvement stores loan out tools and other equipment? If you are doing work at home that requires certain items for a brief time, instead of buying them and only using them once, go to a home improvement store and see if you can just borrow what you need. They charge a small fee, of course, but it is less than buying the item. They say you should never go to the grocery store when you’re hungry. Now add this reminder: don’t shop without a list! To prevent unnecessary purchases, create a list with only the necessities. Stick to the list — anything not listed is not something you should purchase — and you’ll be able to save money the next time you’re at the supermarket. This rule applies anytime you go shopping. If you need new furniture or new clothes, you should create a list before you head out to the mall as well. Set a spending limit for yourself based on what you are planning on buying and stick to it. Some people are a little embarrassed to use coupons. This is an unfortunate mindset. There’s nothing wrong with trying to save as much as possible. If you can avoid paying full price, why shouldn’t you? Although it’s nice to dine out once in a while, remember that this can be a very expensive outing. You’re paying high, marked up prices for dinner and you have to include the tip, too. Eating at home is less costly. Save the nice dinner for a really special occasion. It becomes much more meaningful, too. Visit thrift shops before buying anything. Other places to try: garage sales and outlet stores. There used to be a stigma attached to thrift shops, but that doesn’t matter now that everyone’s trying to stretch their dollars. Thrift shops have a lot to offer, and you could get really great clothes for much less. Don’t spend time browsing shops online just for fun. You might be tempted to buy stuff that you really don’t need. Similarly, leave your credit card at home if you know a trip to the mall could tempt you into making an unnecessary purchase. The point is that you should never put yourself in a situation where you might be tempted to spend beyond your means. This is a good way to prevent impulse spending. Sometimes you see a really nice pair of shoes or a jacket, and you decide you want them. However, this impulse buy could end up in regret if you realize later on that you don’t actually like the color of the shoes or that the jacket doesn’t suit you. The solution: write down the items you feel like buying. If after thirty days, you check the list and you decide you really want any of those things, that’s the only time you should make the purchase. As a matter of fact, this rule could apply to any purchase – from a new TV to new kitchen appliances – even to a new car. Cancel that gym membership. Run or bike around your neighborhood — that’s free exercise. Spend an afternoon at the park playing with your kids, or play Frisbee with some friends. Being healthy doesn’t mean you have to spend too much. Does the thought of living a frugal lifestyle scare you? Understand that there is a significant difference between someone that is poor and someone that chooses to live a frugal lifestyle. Even some of the wealthiest people in the world drive older cars, live in tiny houses, and are very cautious about what they spend their money on. Living frugal doesn’t mean no fun. You can still do lots of fun stuff and even enjoy a nice vacation and a well decorated home. You just need to establish your priorities and then spend accordingly.